Jack Vance died in 2013, but his work continues to be avidly discussed and appreciated. New readers are still discovering his timeless SF adventures like Big Planet, and publishers like Subterranean have produced gorgeous collections like The Early Jack Vance (five volumes) and The Jack Vance Treasury. And his mass market paperbacks from DAW, Ace and others remain inexpensive and continue to circulate, winning him new readers. 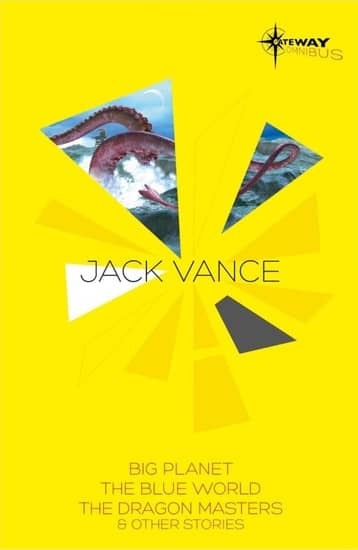 I’ve quite enjoyed some of the more recent discussions of Vance, like Hector DeJean’s January 11 Tor.com article “A Lean, Mean, Writing Machine: Jack Vance Was Science Fiction’s Tightest Worldbuilder,” which looks at three of Vance’s early novels from a rather different perspective. Here’s the opening paragraphs. I’m a big fan of concise stories. If a writer fills a three-volume science fiction epic with 2000 pages of detailed worldbuilding, intriguing speculative concepts, and captivating character arcs, that’s all well and good, but if that writer can get that down to 300 pages, that’s better. And if a writer goes further and nails it in 150 pages — well then, that writer can only be Jack Vance. Vance produced well over 70 novels, novellas, and short story collections over the course of his writing career, creating fantasy stories and mysteries as well as science fiction, and even producing a substantial number of doorstoppers that would have impressed George R. R. Martin with their girth. Vance’s extensive oeuvre has its imperfections — especially glaring today is his near-complete lack of interesting female characters — but at their best the books set an excellent standard for the construction of strange new worlds. Three tales in particular, The Languages of Pao (1958), the Hugo Award-winning The Dragon Masters (1962), and The Last Castle (1966), squeeze artfully assembled civilizations into focused, tight paragraphs. Other authors might have used these worlds as settings for bloated trilogies, but Vance quickly builds each society, establishes his characters, delivers the action, and then is off to create something new. I can’t think of any other author who put together so many varied worlds with such efficiency. I think DeJean has a fine point. Vance’s early experiences writing for the markets, and especially the painful and arduous task of substantially cutting his first novel, Big Planet for publication in hardcover (and later at Ace), taught him the valuable skill of spinning a complex tale in a very small space. 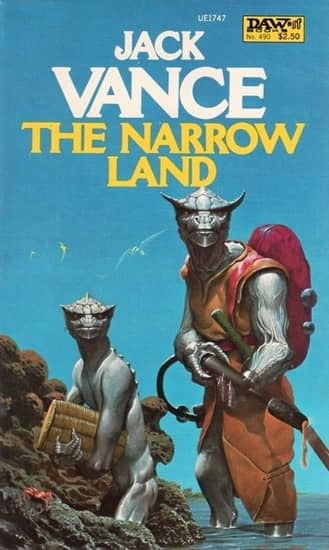 Around the time he wrote these three science fiction tales, Vance also wrote a short story in which he packed one of his most intricate cultures into a mere 35 pages. “The Moon Moth” (1961) is an extraordinary example of worldbuilding, set within a one-of-a-kind mystery… It’s a feat that many other authors would have stretched into a novel, or filled with paragraphs of clunky exposition, but Vance, as always, breezes past bloat and tedium, depicting a fully-formed world with the fewest possible brush strokes. Read DeJean’s complete article at Tor.com here. Jack Vance is my favorite Science Fiction writer. He was equally adept at short stories and novels. “The Moon Moth” is a SF masterpiece. The ACE Double with Vance’s THE LAST CASTLE and THE DRAGON MASTERS is a gem! 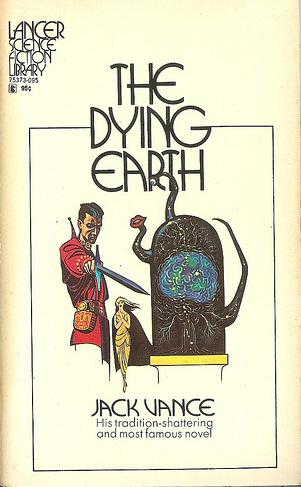 And then, there’s THE DYING EARTH, an early work that forecasts many of Vance’s themes. And, best of all, Jack Vance stands up to rereading! I’ve never read Vance but have heard A LOT about him. The most intriguing about Vance, for me, is that Gary Gygax (one of the main creators of Dungeons & Dragons) cites him as a *primary* influence for D&D, which is interesting since I understand that Vance’s Dying Earth series is primarily sci-fi, not fantasy. Or am I wrong about that? Does any Vance fan here see an obvious connection between Old School D&D and Vance? The notion of “spell memorization” (where you have to kind of jam the spell into your brain, and when you cast it, it’s gone unless you rememorize it) came straight from the Dying Earth stories; as did ioun (or IOUN, as Vance always calls them) stones. And the Cugel the Clever books in particular (Eyes of the Overworld and Cugel’s Saga) kind of read like the adventures of a somewhat sociopathic and possibly not as clever as he thinks he is PC. Vance was indeed one of the greats. I read The Languages of Pao this summer (just the way it should be read, in a 40 cent Ace paperback) and it was just what such a story should be – an intriguing premise developed with economy and flair, set in a colorful milieu, all packaged in a book that can be read in a few sittings (without feeling at all rushed.) We need more like that. Just an aside John. Has anyone at Blackgate taken a look at the Gateway Omnibus series. I saw a whole bunch of them turn up at my local Half Price Books. The covers are weird but they seem dedicated to getting some lesser read classics out there in an inexpensive format. Glenn — you read my mind. I found more than half a dozen at Half Price Books in Lombard, IL, and took four of them home. I was thinking of writing a brief article on them later this week. I agree completely — they’re a real bargain, and a great way to get some classic work from great writers in a sturdy format. They weren’t well distributed in the US (if at all), and can be hard to find. I’ll see if I can figure out how many there are. And yeah. I’m not wild about the covers either. She did her share of series, but Tanith Lee did a lot of great singletons too. Vance is one of my favorite writers. Actually he’s probably first on the list. I’ve read a lot of his stuff over the years and not nearly enough. > She did her share of series, but Tanith Lee did a lot of great singletons too. Tanith Lee is another great choice, and a fine Vance contemporary. I thought she was also a Grand Master winner… but I checked, and she was not. James – it’s been a long time since I read the sequence (‘Rhialto the Marvellous’ being the last I read and that was when it came out) but my memory is that the Dying Earth series is Science Fiction in much the same way as ‘Dancers at the End of Time’ by Moorcock is Science Fiction – ie, fantasy to all outward appearances, but with a (supposedly) scientific basis. Basically rival magicians trying to outwit one another, similar in vein to CAS’s stories. There may even have been an overlap re the latter: I think ‘Turjin of Miir’ – the first in the sequence – came out in the 30’s or 40’s prior to the first volume, but I could just be talking through my a***. I always love the talk on Vance and his legacy. Good covers in the middle – Artist is Tom Kidd and was commissioned to do these for this at least! Now, planetary mass grain of salt of course. I’m getting into this conversation late. 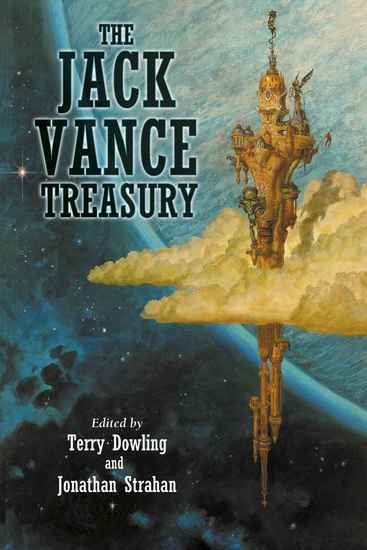 I also got into Jack Vance late—my dad often sang the praises of a Vance book called “The Blue World”. I had to wait for ebay to evolve and for my ebay skills to develop before I finally got a copy of it in like 2004. And “The Blue World” hits all the high points of this article—a world fully developed in a few pages, and a culture fully developed in a few more and then off to the races! I followed that up with “The Gray Prince”, which was a find a used bookstore. While a more complex story than “Blue World” it was also an excellent story in a world with overlapping alien races and multiple (three, I think) human cultures. Finally, in an effort to dig deeper into the roots of S&S and D&D I got a copy of DYING EARTH, like ten days ago. Which I already read. DYING EARTH is a collection of remarkable stories. It has a full-speed-ahead feel of an inspired amateur. A fine mini-review of three classic Vance tales! In fact, if you ever want to do a triple review/comparison on Black Gate, those three paragraphs make an excellent start. I like your infectious enthusiasm. Was very pleased to discover that Spatterlight had released seemingly everything by Vance on paperback two years ago. Especially the short story collections, because the short stories are much harder to collect than the novels. Not sure why more people didn’t talk about this paperback event. Hardly anyone could afford the hardcover collection, ebooks are not desirable for lots of us, so I really appreciated a huge paperback library release. I have only scratched the surface of Vance’s works. If memory serves The Dragon Masters was my introductory novel. While I don’t recall thinking critically on his world building skills, I am grateful for Hector’s article (and to John for sharing it) for opening my eyes. Indeed thinking of Big Planet, not to forget the excellent Slaves of the Klau on the other side if you have the Ace Double version, I was very impressed with all the cool concepts packed into such a short novel. I wasn’t aware his works influenced D&D so much but after reading the comments also something that becomes pretty clear. I remember thinking when I put Big Planet down “how cool would that world be for a RPG”! Talking of which, wasn’t Talislanta also a big tip of the hat to Vance? Great article and very much enriched by the insightful comments and tips of what to look out for. Methinks my next read may well be the first unread by me Vance that comes to hand. > Was very pleased to discover that Spatterlight had released seemingly everything by Vance on paperback two years ago. > Especially the short story collections, because the short stories are much harder to collect than the novels. I’m glad you mentioned Splatterlight. I’ve been steadily collecting their Vance volumes, and I really like them. They’re print-on-demand, but they have original covers, and I think they follow the text of the (very expensive) Jack Vance Integral Editions, which are almost impossible to find. I think Splatterlight is doing wonderful work bringing these books out in inexpensive paperback editions. And you’re absolutely right that it’s the short fiction that’s hardest to find. My only complaint is the books are short and rather expensive. > Talking of which, wasn’t Talislanta also a big tip of the hat to Vance? > You may think that you own enough role-playing games, but you’ve never seen one like Talislanta. > I was reading a lot of Jack Vance at the time, and it made me want to try something completely different. > Methinks my next read may well be the first unread by me Vance that comes to hand. John, ah so that’s where I read it, ha ha. Fascinating world Talislanta, have never played it but have a load of the bard games era material and some ideas have certainly cross pollinated our RuneQuest home grown world. Re the next Vance, for sure, if it’s something that hasn’t been covered here I will do a write up.